The Cassini shuttle, that has been in Saturn’s orbit since 2004, took some spectacular images of the rather elusive moon, along with geophysical measurements. A crater-riddled, icy landscape covers Saturn’s moon Dione, but that doesn’t take away anything from its charm. This view from NASA’s Cassini spacecraft looks toward Saturn’s icy moon Dione, with giant Saturn and its rings in the background, just prior to the mission’s final close approach to the moon on 17 August 2015. At lower right is the large, multi-ringed impact basin named Evander, which is about 220 miles (350 kilometres) wide. The canyons of Padua Chasma, features that form part of Dione’s bright, wispy terrain, reach into the darkness at left. Image credit: NASA/JPL-Caltech/Space Science Institute. Though it’s nowhere near as famous as some of Saturn’s other moons – especially Titan – Dione is still significant. It’s the smallest of the “large moon” in our solar system, consists of two thirds water ice and one third rocks, likely silicate rocks. The most remarkable geological feature on Dione is the “wispy terrain” which puzzled scientists for two decades before Cassini took some close up pictures. Basically, when the Voyager space probe photographed Dione in 1980, it showed what appeared to be wispy features covering its trailing hemisphere, and no one knew what they were. Cassini revealed that the ‘wisps’ were, in fact, not ice deposits at all, but rather bright ice cliffs created by tectonic fractures (chasmata). Now, Cassini’s back with even more great images. 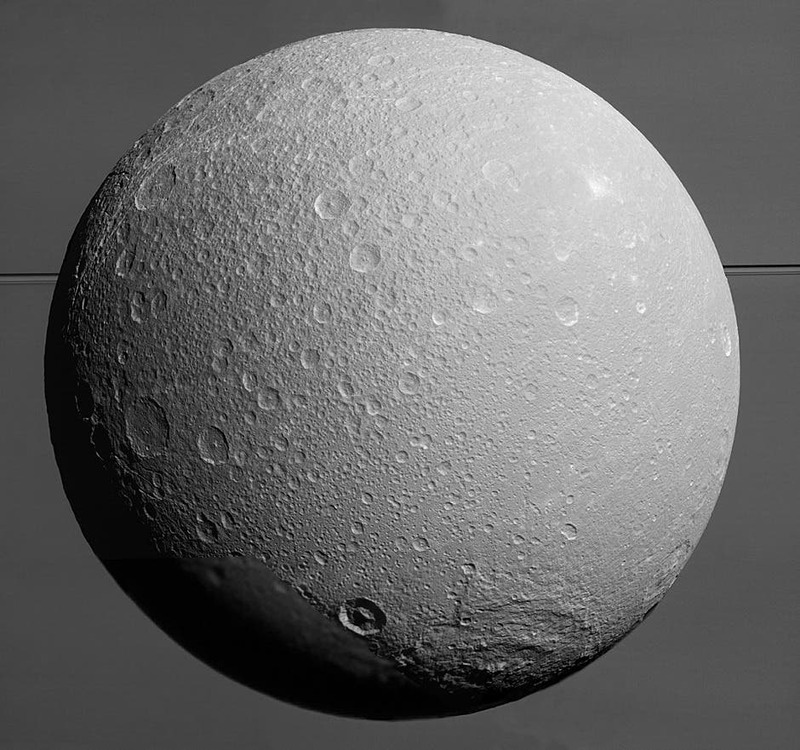 The view was acquired at distances ranging from approximately 37,000 miles (59,000 kilometres) to 47,000 miles (75,000 kilometres) from Dione and at a phase angle of 145 degrees. Image scale is about 1,300 feet (400 metres) per pixel. North on Dione is up and rotated 34 degrees to the right. Image credit: NASA/JPL-Caltech/Space Science Institute. Cassini’s closest approach passed the moon at a distance of only 295 miles (474 km), offering a high-resolution view of Dione’s north pole and conducting gravity and magnetic data on the moon. Cassini’s long mission will come to an end in 2017, but until then, it still has a lot to do; on October 14, it will pass by Enceladus at a distance of only 49 km, enough to sample water from its spraying plumes.